Background Ankylosing Spondylitis (AS) is a complex chronic inflammatory disease strongly associated with the majority of HLA-B27 alleles, with the exception of B*2706 and B*2709. GWAS studies have revealed that other genes are also involved in AS pathogenesis such as ERAP1 which is able to cleave TNFR1 and IL-1R2 cell surface receptors, supposed to play a pivotal role in AS pathogenesis. Objectives To analyze the cell surface expression of TNFR1 and IL-1R2 receptors and the possible influence of ERAP1 allelic variance. Methods The percentage of CD14 negative peripheral blood mononuclear cells (PBMC) expressing TNFR1 and IL-1R2 receptors on the cell surface was evaluated in 12 HLA-B*2705 patients with AS, 12 HLA-B*2705 healthy subjects (HC) and 12 HLA-B*2709 HC by means of flow cytometry analysis and CD120a and CD121b monoclonal antibodies, respectively. 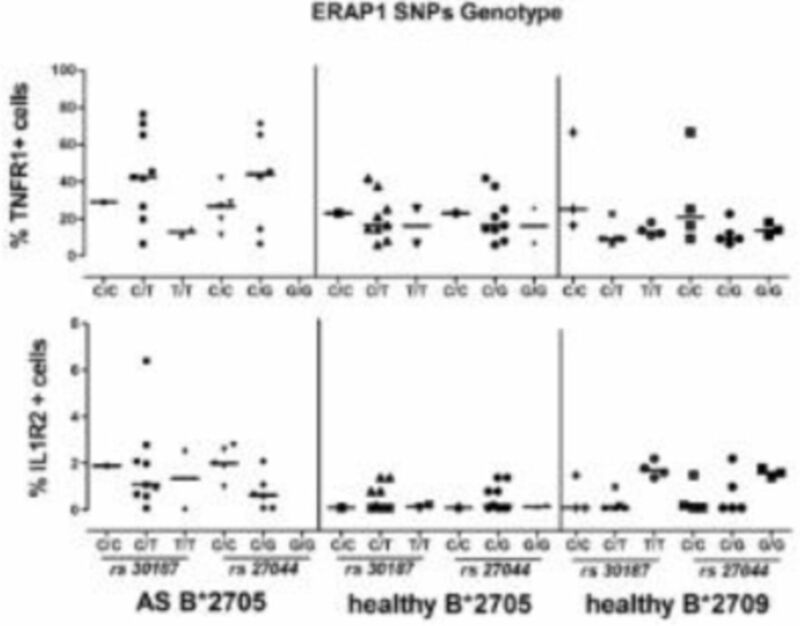 Patients and controls were genotyped for two ERAP1 SNPs associated with AS (rs27044 C/G and rs30187 C/T). Values were expressed as median percentage of positive cells (interquartile range). The differences between AS patients and HC were analyzed by Mann Whitney U-test. Conclusions This study shows a higher expression of TNFR1 and IL-1R2 on the PBMC surface of AS patients compared to B*2705 and B*2709 regardless of ERAP1 allelic variance, underlining the important role of these two cytokines in the pathogenesis of AS.